The latest in an occasional series of books that turn my crank, and which I think you’ll like, too. 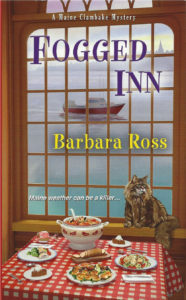 Musselled Out (2015) and Fogged Inn (2016) by Barbara Ross (Kensington Books), the 3d and 4th in the Maine Clam Bake mysteries. I love this series. Barb Ross is writing some of the smartest cozies around. Julia Snowden took a break from her career in venture capital in NYC to return to her Maine hometown to help her widowed mother, sister, and brother-in-law brink the family’s clambake business back from the brink. She’s succeeded, but not without personal peril, murder, and unexpected romance. 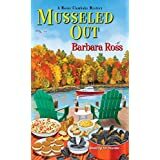 In Musselled Out, her boss’s patience is running out, and she’s got to decide whether to stay—while investigating the death of a potential competitor, the disappearance of a local lobsterman, and the strange doings of her own mother. “The Last Best Book” is my occasional post on a favorite recent read — playing on one of Montana’s many nicknames, The Last Best Place. A handful were published in 2016; others go back a few years. 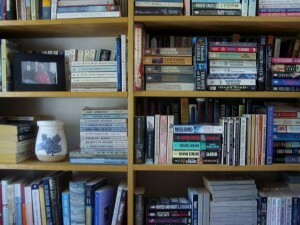 I’ve included audio books—yes, listening to a book is reading it, albeit a different experience. And I love audios—the narrators create their own worlds for me, and I get to read books, especially nonfiction, that I might not otherwise pick up. Of 57 titles, including 46 novels or story collections, 18 were published in 2016 and 13 in 2015. (One will come out in 2017.) Yay—I’m catching up! No doubt I’ll still have read like a demon this spring to be ready to vote for the Agatha Awards, especially since only one of those 2016 titles was a first book. But books from earlier years rose to the top as well, so I’m listing my faves, in no particular order, regardless of when they were published. The Last Bus to Wisdom, Ivan Doig (2015) Alas, the last novel by the great Montana writer, but a fitting end to a storied career. IMO, Doig was at his best when writing in the voice of a young boy—here, Donal Cameron, age 11, sent by “dog bus” (the Greyhound) from north-central Montana to a great-aunt he’s never met in Wisconsin, in 1951. Part road trip, part buddy story, part coming–of-age novel, with Doig’s keen eye and ear—pure delight. The Orphan Train, Cristina Baker Kline (2013) An intriguing snippet of history, with a surprising modern parallel. Whistling Past the Graveyard, Susan Crandall (2014) Hmm. The third historical coming-of-age novel on the list. A different time and place—Mississippi, 1963—but just as powerful. Little Pretty Things (2015) and The Day I Died (2017), Lori Rader-Day. The winner of the Mary Higgins Clark Award for 2015 is a major new talent. 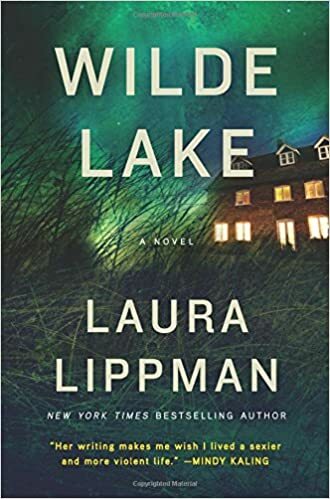 Wilde Lake, Laura Lippman (2016) Not sure whether I’m more impressed by the story or its structure. Masterful. The Ex, Alafair Burke (2016) Smart and wicked—a great combo. 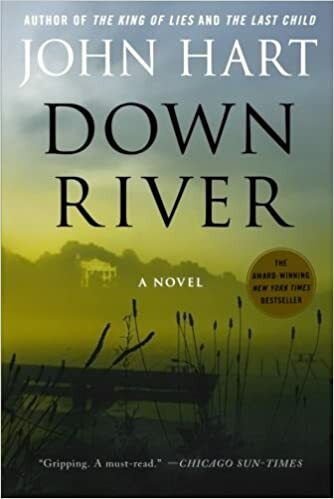 Down River, John Hart (2007, audio) and A Killing at Cotton Hill, Terry Shames (2013) Two authors who deserve to be better known. Set in North Carolina (Hart) and Texas (Shames), both books convey their authors’ love of the land as well as their deep understanding of crime and family. 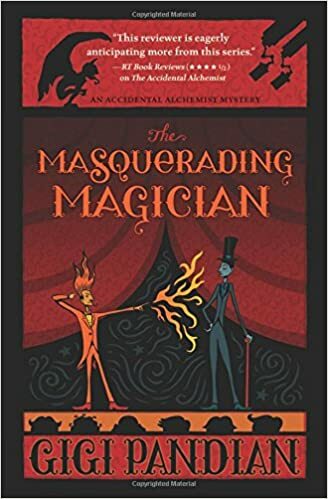 Two fun historical mysteries: Murder in Morningside Heights, Victoria Thompson (2016), the 15th or 16th Gaslight Mystery, and Delivering the Truth, Edith Maxwell (2016), the first Quaker Midwife Mystery. And I’m finally catching up with Deborah Crombie and Jacqueline Winspear, reading several books by each this year, every one a true joy. A special mention for a short story collection, All the Wrong Places, by Molly Giles (2015). Giles’ stories are smart, funny, with an amazing range and dialogue that makes my writerly heart churn with envy. 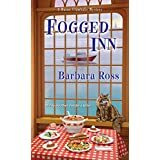 I met Molly this past summer on a perfect evening on a friend’s deck overlooking the Swan River, and am so happy that I liked the stories as much as I like the woman herself! An occasional series in which I share a recent read I loved. I picked this book up for two reasons: Author Terry Shames was the moderator for a panel discussion on small town crime that I participated in at the Left Coast Crime mystery convention in Portland, March 12-15, and I like to be familiar with the work of others on the panel. 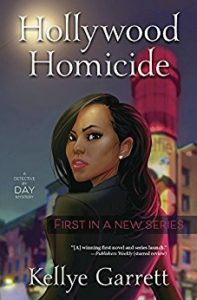 And her first book, A Killing at Cotton Hill, won the 2014 Macavity Award for Best First Mystery and was nominated for the 2013 Left Coast Crime Best First award. As a Best First winner myself (Death al Dente won the 2013 Agatha Award for Best First novel), I love reading other new writers. But even before I met her, I knew Terry Shames was an old hand. Why she hadn’t been published before, I have no idea, but this is a writer with great control. 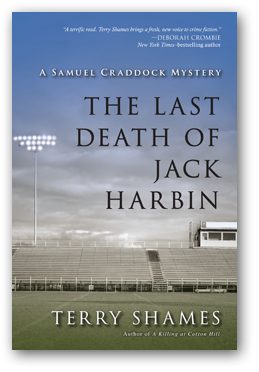 Samuel Craddock is the retired police chief of Jarrett Creek, Texas, a fairly recent widow with a bad knee and a reputation as a kind man who gets to the bottom of things. 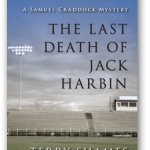 In The Last Death of Jack Harbin, we meet a cast of characters who have run up against some of life’s rougher edges. Some respond better than others, of course, letting their scars make them more human, gentler rather than harsher. It’s this variety of responses that I most enjoyed in Shames’ novel. I have not been to Texas, but I feel I know Jarrett Creek. People are people pretty much everywhere, but they have their own local variations, and Shames portrays them clearly—they are recognizable without being cliched. Small town relationships and routines, the importance of high school sports even 20 plus years later, the military veterans, the religious fanatics, the men and women who fall beneath the cracks and the men and women who pick them up. They’re all here. As I said, control is the Shames’ hallmark. There’s a little violence, yes, but only what’s needed. 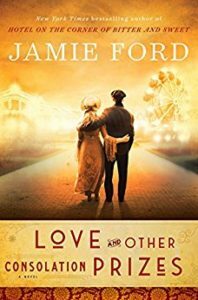 Emotion, setting, clear and vibrant language, backstory—we’re given pretty much all we need to understand these characters, and nothing superfluous. The mystery is solid; the secrets of the past keep coming. And Samuel Craddock is a crackerjack of a character. Take the trip to Jarrett Creek. If you like a good mystery, I think you’ll be glad you did. Last May, I gave a book talk at a rural library about 50 miles from my home. I was just back from Malice Domestic, and the staff, Friends of the Library, and patrons helped me celebrate my Agatha win. Naturally, we talked about other Agatha winners, and the winners of the Edgar Awards, which had been given out a few days before Malice. One woman confessed her dismay that her favorite author, Louise Penny, had not won the Edgar Award for Best Novel for How the Light Gets In. She’d immediately bought the winning book, Kent Krueger’s Ordinary Grace, convinced that it could not possibly deserve the award. She read it in two nights, and now has two favorite authors. Took me a little longer to get to it. My friend was right, and I too now have another favorite author. 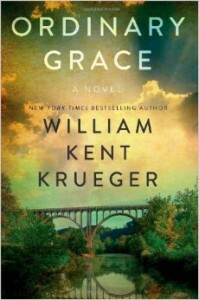 Less a crime novel than a coming-of-age story exploring the effects of death—both accidental and criminal—on a family and on a community, Ordinary Grace is simply stunning. Thirteen year old Frank Drum tells the story of the five deaths in the summer of 1961 in a small Minnesota town, each different, each leaving a permanent mark that makes Frank a different man than he might otherwise have become. He’s the son of a minister, whose experience in the war diverted him from his plans to be a lawyer, and a musician who is not as keen on God as her husband is. Frank’s older sister Ariel is a brilliant musician; his younger brother Jake is both his best friend and a bit of a mystery. The language is beautiful, but because Krueger is also a mystery writer, it never overwhelms the story, but always serves character and plot. I read the audio version. (And yes, I read audio books. It is a different experience, but it’s still reading, even though it uses the ears and not the eyes.) The narrator did a terrific job, infusing Frank’s narration with just the right mixture of knowing and innocence. He also slipped in a bit of the Minnesota accent—but not too much—and captured beautifully the way a Sioux man of Warren Redstone’s age would speak. I’m so glad my friend in Ronan read this book and recommended it to me. Now I’m recommending it to you.